A review of “Sicario,” Denis Villeneuve’s disturbing drama set in the world of law enforcement and Mexican drug cartels. Rating: 3.5 stars out of 4. 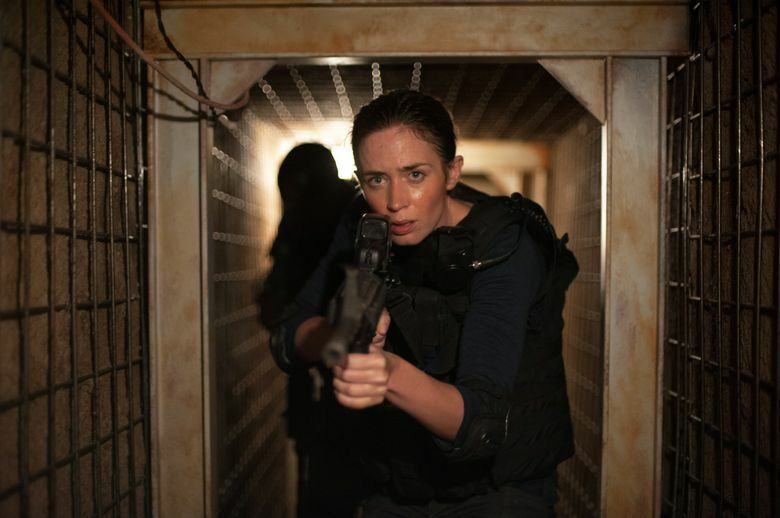 So much of “Sicario,” Denis Villeneuve’s disturbing drama set in the world of law enforcement and Mexican drug cartels (the title is the Mexican term for a hit man), takes place on Emily Blunt’s face. As hardworking FBI agent Kate Macer, she’s constantly pausing, thinking, figuring things out, and Blunt lets us see the wheels turning as Kate carefully weighs and chooses her words. A lonely recent divorcée, Kate pours herself into her work (she’s based in Arizona, on the Mexican border), and she’s wound tighter than a villain’s smile; in one close-up, gazing into a mirror, you can see the tiny throb of her jaw twitching. Kate’s seen more than she wants to, and more than the “Sicario” camera will show us; Villeneuve, and masterful cinematographer Roger Deakins, carefully control our gaze. The film begins on a devastating discovery of corpses hidden in the walls of a non­descript house near the border, the work of a vicious cartel. Soon, Kate’s selected to join a black-ops mission, alongside a mysterious Colombian operative named Alejandro (Benicio Del Toro, chillingly present) and rogue FBI agent Matt Graver (Josh Brolin, breezily tense). Harrowing trips are made, to Mexico City and back again (there’s a sequence taking place at the border during gridlock, shot from above, that’s an instant classic of action filmmaking); lives are lost; questions are asked but rarely answered. Jóhann Jóhannsson’s dronelike score slices into the air like a knife; the camera flies across the arid, seared-out ground, where it seems as if no life could flourish. ‘Sicario,’ with Emily Blunt, Benicio Del Toro, Josh Brolin, Victor Garber, Jon Bernthal, Daniel Kaluuya. Directed by Denis Villeneuve, from a screenplay by Taylor Sheridan. 122 minutes. Rated R for strong violence, grisly images and language. Meridian, Lincoln Square.